✔Wheel casters give instant mobility to stationary objects in your workshop, garage, warehouse, and much more. Our wheels come in four-packs. The three-inch general duty threaded stem caster with locking brakes give fluid mobility to heavy loads on hard industrial surfaces such as finished concrete floors, where quiet movement, smooth cornering, and floor protection are necessities. ✔This caster wheel sets are the perfect solution for better positioning your carts, stands, and racks to any desired location in your garage or workshop. The double lock mechanism locks both the back wheels and the swivel bearing at the same time, which is essential for safety in the workplace. The wheels themselves are non-marring and will not markup floors -- while the 360-degree pivoting action offers a soft cushion ride for taking corners and odd angles with greater precision. ✔Double lock mechanism of both swivel and wheel rotation ensures stability. While all four swivel 360-degree pivoting action for smooth wheeling on hard, smooth surfaces such as concrete with very low dragging. 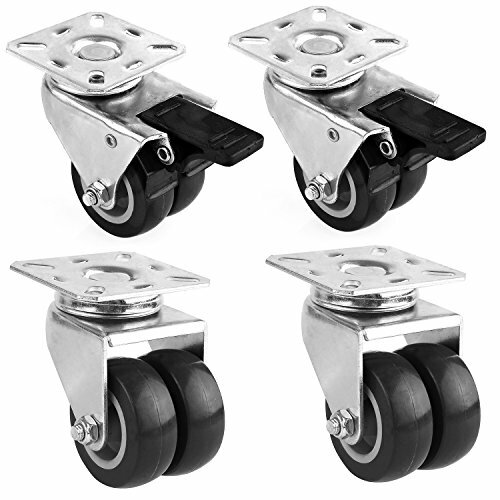 ★HIGH QUALITY WHEELS: This swivel caster wheels are made of superior soft TRP and high quality iron bracket, sturdy and durable for long-lasting service value. ★HEAVY DUTY: Steel structures body is extremely hard wearing and resistant to dirt and allows the steel casters turn smoothly and silently, total capacity for this 4 pack of wheels set up to 660lbs. ★OMNI-DIRECTIONAL TWIN WHEELS: 4 universal twin wheels allow for more surface area in contact with the floor, higher performance keeping stabilization. 360 degree top plate and non-marking black rubber, has the advantages of flexible movement, stable lifting, easy operation and so on. ★MUTIPLE USES: This soft rubber wheel castors designed as replacement wheels for carts, furniture, dolly, workbench, trolley and more, suitable for use on all types of flooring such as home, shops, schools or hospitals. ★SIZE: 2 inches diameter soft rubber wheels, 2 locking casters size: 4.53*2.95*2.36inches (115*75*60mm), 2 casters non-locking casters size: 2.95*2.36*3.35inches (75*60*85mm).